In humans, viral infections causing respiratory disease have been known for many years. Every now and then such viruses may cause epidemics involving large groups of people or even pandemics with spread across the world. At the end of last century and at the beginning of this century zoonotic viruses emerged that were of serious risk for the human population: severe acute respiratory syndrome (SARS) caused by SARS coronavirus (CoV), highly pathogenic avian influenza (HPAI) virus H5N1, and pandemic influenza virus A(H1N1)pdm09 (pH1N1). Both SARS-CoV and influenza A viruses cause respiratory disease that may lead to severe and even fatal cases of pneumonia. The course and outcome of the infections is related to their pathogenesis, which can be explored by describing and comparing pathology, virology, and genomics. 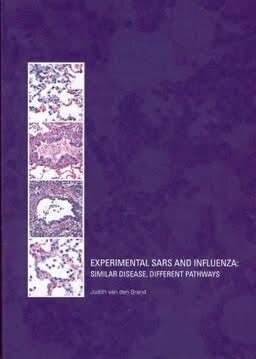 Understanding the pathogenesis of SARS and influenza is valuable for development of therapeutic and preventive strategies. Since the pathology of acute human fatal cases in SARS and influenza is rarely described, there is a need for animal models to provide information about the early stage of the disease. Also, pathological description of human cases with uncomplicated viral pneumonia is sparse because patients have multiple therapeutic interventions and secondary co-infections that may alter the pathology. Interestingly, the pathology of SARS-CoV and influenza virus infections has similar features; however, there are also differences in disease outcome. 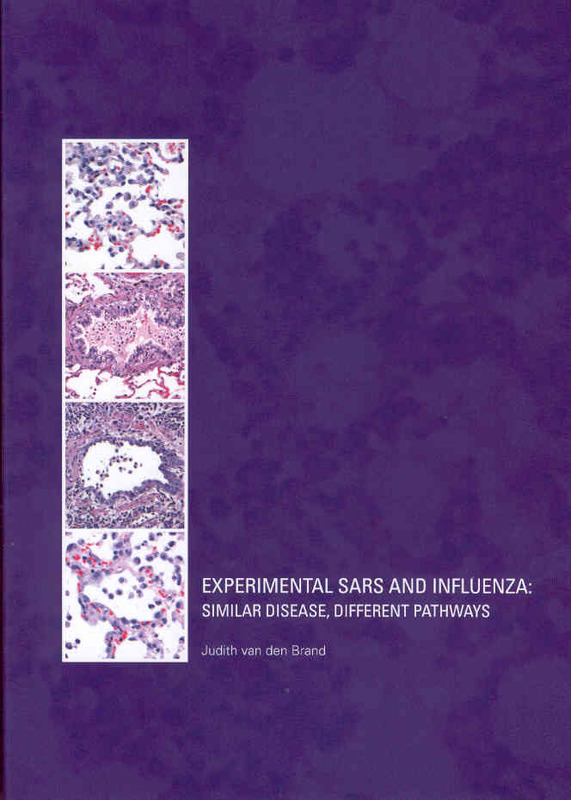 This thesis focusses on the pathology of SARS-CoV and influenza A virus infections in experimental animals. The pathology of these virus infections in animals is compared to that in humans and is related to the pathogenesis. The animal species that are used in this thesis to study the pathology of SARS-CoV infection are; cynomolgus macaques, African Green monkeys, ferrets, and cats. The pathology of influenza virus infection was studied in cynomolgus macaques, ferrets, and cats. Additionally, temporal and spatial dynamics for the pathology of different influenza virus infections in ferrets is described in a time course experiment. Finally, the effect of vaccination on the pathology is studied in ferrets and cynomolgus macaques for SARS-CoV infection and in ferrets for pH1N1 infection.